Summer is here. You and I both know what that means: Beach time, pool time, cookouts, parties, practically anything outdoors. Am I right? Of course I am. We generally want to be outdoors in the summer. That’s what we crave. But, what is our number one problem when it comes to summer time? Other than those pesky mosquitoes and annoying insects, that is. Sun Burnt Skin. We don’t want them. We don’t like them. They’re itchy. They’re painful. They cause our skin to peel. They just don’t make us happy campers. But yet we still want to go outside to get some extra vitamin D in our systems and to have that nice, tan, glistening skin. And even though getting vitamin D and a nice tan makes us feel good about ourselves, sometimes the process to get there is not the most ideal. So, what we want to do this summer is avoid sun burnt skin at all costs. Because, not only is it extremely unpleasant to deal with, but it also damages the layers of skin underneath. But, we need to understand that it will happen, probably at least once, this summer. 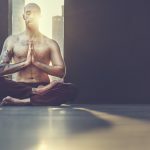 When it does happen, follow the advice below on how to make it all better. Sun burns are the same as heat burns; You can categorize both. In other words, a 1st, 2nd, and 3rd degree burn are all possible with sun burnt skin. The burns go as follows. 1st Degree: Typically causes dryness of the skin along with peeling. It may take anywhere from a few days to a week to fully heal from this type of burn. 2nd Degree: Typically causes dehydration within the body and may result in infections in certain areas of the skin. 3rd Degree: Typically can cause the burn patient to visit the hospital. IV’s are usually set up on the patient, some are even transported to the hospital’s burn unit. If vital organs are affected, the patient may go into shock. Other than these symptoms, many health care professionals advise those that acquire a sun burn to look out for symptoms such as fever or chills, severe blistering, headaches, severe pain, nausea, vomiting, dizziness, confusion, rapid heartbeat, extreme dehydration, reduced urination, pus development, and swelling or tenderness around blisters. If any of these symptoms arise, seek medical help immediately. For the remainder of this article, I’ll advise you on what to do for a 1st degree burn. The 2nd and 3rd degree burns should be treated by medical professionals. First and foremost, if you have a sun burn, stay away from the sun until you recover. You don’t want to keep damaging the layers of your skin. 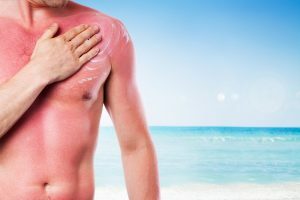 To even further this argument, many health care professionals tell their patients with sun burns to avoid going out in the sun for several weeks, depending on the severity of the burn. For example, if you have a sun burn and your skin starts to peel, you should allow your skin to heal up a little bit before going back to the beach. Many doctors recommend avoidance of sun for a few weeks if the skin starts to peel. This is because fresh, newly peeled skin is more susceptible and sensitive to further skin damage. If you do go out in the sun, be sure to put an adequate amount of sun screen on to protect these areas. Keep applying accordingly. If the sunburn is painful, or if it’s irritating you and you’d like it to heal faster, I recommend taking a cool bath every night. If you don’t like baths, take a cool shower. Do this every night until your skin starts to feel better. It could be a few days or it could be an entire week, it all depends on the severity of your burn (still talking about 1st degree burns, though). Colloidal oatmeal is also a big help. This can be found in the bath products area of the drug store, and it can only be used when taking a bath. To ‘kill two birds with one stone,’ you want to take care of the pain while moisturizing. Products like lotion and moisturizers filled with aloe can do just that. The soothing and healing properties act as a 2-in-1. While you’re at it, avoid anything that may have any type of rubbing alcohol in it. For example, don’t spray any fragrances on your skin, as this could cause additional burning sensations to occur. If the pain or irritation continues after a day or so, start to take some Ibuprofen or aspirin. Keep in mind, if your burn contains blisters on your skin, DO NOT TRY TO POP THEM. Allow them to drain on their own. If the blister is too big and causes too much pain, go see your doctor as soon as possible. As your body heals, you may experience severe dryness in certain areas. Continue to moisturize. If it gets too unbearable, go see your doctor. 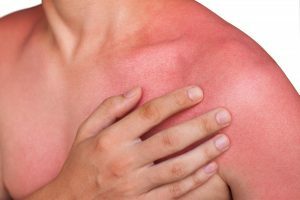 When speaking about sun burns, you need to understand, first and foremost, that they are easier to prevent than to treat. And we all know the number one way to prevent sun burns: APPLY SUN SCREEN. But, there are other ways, besides applying sunscreen that will help you and your skin. First, try to avoid going out in the sun at peak times during the day. When I say peak times, I mean don’t be outdoors when the sun is at its strongest. And, if you’d like to be outside during this time, limit your sun exposure. Second, wear hats and sunglasses to prevent burns on your face. Last, keep applying and reapplying sun screen to areas of the skin that are not covered by clothing or bathing suits. That means if you go in the water at the beach or the pool, reapply when you get out of the water. In addition, reapply sunscreen after sweating a lot and after drying off from the water. 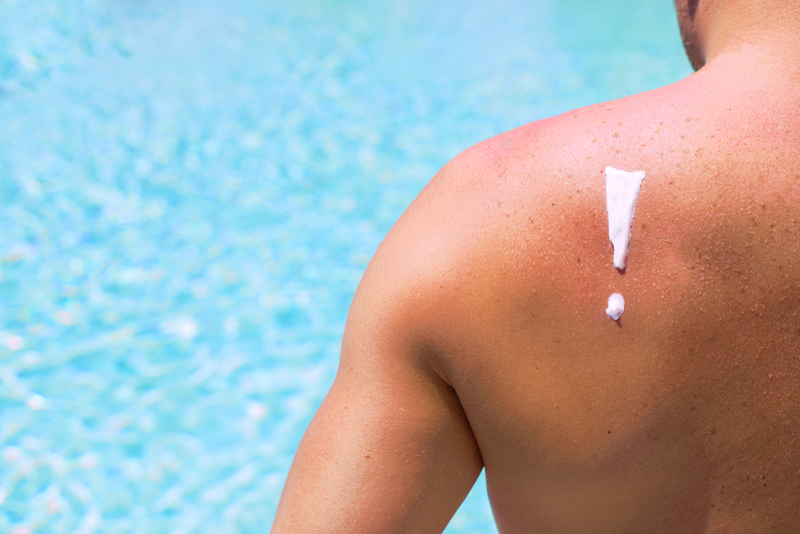 Other than that, reapplying sunscreen every two hours should keep you protected.